A year ago, you couldn't find a laptop with an HD DVD drive for under $2,000. The Toshiba Qosmio F45-AV425, with an HD DVD-ROM, is now selling for a cool $1,599 (direct). It's a less luxurious version of the Qosmio G45-AV680—Toshiba's exorbitantly priced flagship media center—but it loads similar processing parts, and you get to watch the latest HD DVD flicks for barely more than half the G45's price. The Toshiba Qosmio F45-AV425 is an HD DVD media center from the Qosmio line that people can actually afford. 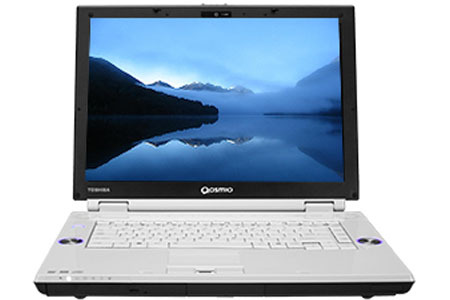 Toshib's Qosmio notebooks are designed for multimedia and the F45-Av425 continues this traditiona by supplying one of the least expensive thin and light notebooks on the market with a HD-DVD drive for watching high definition movies. But the system can do much more than just playback DVDs making it a solid choice for those looking for a general purpose notebook that also can be used as a portable high definition video player. Time for the Toshiba Qosmio F45 AV412 to take the ranks in Laptop Logic’s testing labs. We pace this laptop to the highest extent, gauge its features, and measure its performance. This mid-sized 15.4” widescreen (WXGA) in 16:10 ratio carries an HD-DVD player, biometric scanner, harmon-kardon speaker system with “subwoofer” port on the bottom, and a multitude of other high end technology features. Toshiba is touting it as the multimedia reference platform in the Qosmio line-up – packing it with the latest and greatest (whatever that’s worth) Windows Vista Ultimate. Let’s see how it performs shall we? Maybe I’m just pessimistic, but when a unit comes my way with obvious flaws, and sticker price reaching $1,500 – I’m a little taken back. The display issue was the biggest thing, but also the numbers for performance weren’t that great. 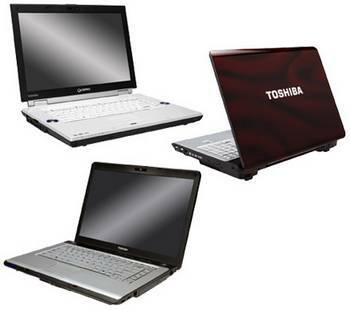 Toshiba packs a smooth design, multimedia amenities, and an HD-DVD drive into an affordable mainstream notebook. Toshiba's latest entertainment notebook, the Toshiba Qosmio F45-AV412, combines good looks with an excellent display, powerful wireless performance, and plenty of amenities that will tempt you to make this machine your digital entertainment hub. And you get HD-DVD playback for not a lot of money. However, a couple of drawbacks prevent this $1,499 notebook from being the cream of the crop. (View Qosmio F45 photo gallery.) Featuring a glossy Cosmic Black exterior and a Piano White interior, the 6.8-pound Toshiba Qosmio F45-AV412 is a tad bulky but certainly stylish. The crisp, bright 15.4-inch (1440 x 900-pixel resolution) TruBrite display looked sharp from a variety of angles, whether we were working in Word, surfing the Web, or watching YouTube clips. The Qosmio F45 is smaller and somewhat less-impressive than its bigger, more powerful-predecessors. But it continues to benefit from Toshiba's developing understanding of what makes a good and workable media notebook. Our only beefs with the machine are its somewhat wonky color scheme and its somewhat lackluster ability to play back high-def video (except, of course, when attached to a capable HDTV, where this unit's surprising lack of an HDMI connector jars our sensibilities yet again). Nevertheless, it's also a good value for the money, and offers surprisingly good performance and decent battery life. Toshiba's Qosmio line is known for high-end home theater features and high prices, and like the flagship 17-inch Qosmio G45, the 15-inch Qosmio F45-AV412 offers a wealth of multimedia extras, from an HD DVD drive (although not the recordable HD DVD drive found in the G45) to a subwoofer to media control jog wheels. For a desktop replacement, these are useful features, but we question their value on a midsized laptop with a maximum resolution of 1,280x800. To include an HD DVD drive on the F45 for only $1,499, Toshiba cuts a few corners, including the use of integrated graphics and a slower processor than its 17-inch cousin. The biggest sacrifice is the smaller, 15.4-inch screen, which cannot support HD DVD's full 1,080p resolution. While movies will still look good at 720p, we are less satisfied with that output when we've ponied up for an HD DVD drive. Toshiba advertises the Qosmio F45 as a "mobile digital entertainment notebook" with a 15.4 in diagonal widescreen for your high definition movies, high fidelity audio and high impact gaming. With an available HD DVD ROM, Intel Centrino Duo processor technology, 802.11ag and draft/n Wi Fi, and a set of powerful Harman Kardon speakers with one subwoofer, the Qosmio F45 might just live up to the advertising hype. But can it deliver, as Toshiba suggests, a true balance of "mobility, performance, manageability and connectivity?" Overall our first impressions of the Toshiba Qosmio F45 are mixed. The F45 has a gorgeous screen, good built-in speakers and dedicated multi-media buttons that make the experieince of controling your movies, music, and web browsing second to none. That said, the plastics used in construction look cheap and the processor and gaming performance are sub-par given the price range. 70.6%: This rating is bad. Most notebooks are better rated. This is not a recommendation for purchase.